Are Unite, the union, abusing the inaccessibility of the 2016 Young Labour Conference by funding travel and accommodation for delegates who have either openly supported or are affiliated with groups who have supported their preferred candidate for Labour’s National Executive Committee Youth Representative? This is a question I’ve been pondering since Monday, when I was offered travel and accommodation as a Labour Students Delegate for Oxford Brookes Labour Club (OBLC), paid for by Unite, and offered to all of the youth delegates in Oxford – regional and students, not just Unite’s own. Just before the end of the Autumn/Winter university semester in 2015, my university’s Labour club held a meeting to elect a new chair, as well as our club’s delegates for the Young Labour conference in Scarborough, at the end of February 2016. I was one of the three delegates selected. Afterwards, one of the club’s members told us that he’d heard that there would be funding for travel and accommodation for “the right kind of people”. That seemed a little iffy, to say the least. Who are the right kind of people? I wasn’t entirely sure what to make of it. At some point in the meeting it was also suggested that we endorse a particular candidate for Labour’s National Executive Committee Youth Representative. We only heard the one name, and a brief summary of why we should support them. There was no mention made of other candidates standing. Enough people in the room agreed that we should support this candidate, so the motion was passed. A day or so later, the other delegates and I were introduced, on Facebook, to someone from Oxford University Labour Club (OULC), a club who also endorsed the same NEC candidate. The previous chair of OBLC mentions that we’ve decided to endorse the candidate. We’re told there will be the chance to get expenses for accommodation from “the unions”, and OULC will be organising a coach to take us to Scarborough. That was a bit of a relief, because I wasn’t exactly sure how I’d get to Scarborough otherwise, and didn’t think anything more of it. Fast forward to Monday. I was added to a group conversation on Facebook with regional, union, and Labour Students delegates to the Youth Conference from the Oxford area. We were told there was good news – Unite will be paying for our accommodation and travel up to Scarborough, to “encourage youth participation”. The conference is far from accessible: tickets are £30 (£40 for Labour Students delegates), plus there’s travel and accommodation for a whole weekend to organise and pay for. Trains from Oxford, even with a railcard, are £75 return. Coaches are no good either, due to being 10 hour journeys and costing about the same. We were asked to fill in a form, provided by Unite, to register for travel and accommodation support. Later in the evening, a friend brought up that OBLC had decided to endorse the aforementioned candidate. After trying to remember how and when that had been decided, I was reminded that it was at the chair/delegate election meeting in November. I visited the candidate’s Facebook page, and noticed that they’d been endorsed by Unite. With a registration fee of £40, and delegates expected to arrange their own travel and accommodation, and no sight of a hardship bursary, I fear that the conference will only be accessible to those with the means to pay. Those with families, or being paid below the living wage, or struggling with high rents, or on Jobseekers’ Allowance, will struggle to afford this huge costs without financial assistance. If we are to have a truly democratic and autonomous Young Labour, then we can’t price members out of our democracy. The more I think about it, the clearer it becomes that Unite are trying to abuse this inaccessibility by providing travel and accommodation for those who have been affiliated in some way with, or have openly endorsed their candidate, ensuring they’ll be there to vote for Unite’s preferred candidate whilst not concerning themselves with other delegates who may not. The candidate themself benefits from the travel and accommodation doubly – not only because they’re guaranteed a certain number of declared supporters, but they attend the University of Oxford and therefore will also be getting free transport and accommodation. There’s no way of knowing if the candidate has any idea about this arrangement, other than that it’s providing free travel and accommodation to delegates from the Oxford area. It seems very much like Unite are trying to indirectly buy more influence in the Labour party by paying for “the right kind” of delegates to attend the conference so they can vote for Unite’s preferred candidate to be elected onto Labour’s National Executive Committee; and they offered the chance to me due to my club’s endorsement. To me, that is unacceptable. The position of NEC Youth Representative shouldn’t be won because an interested group paid out to guarantee the attendance of supporters of their candidate, but should be a decision for all people who won delegate positions. Everyone should be made able to attend, as the Chair and NEC candidates have all argued, regardless of who they support. I voted for Corbyn in the leadership election, and know how important unions are. For all the talk of ‘a new kind of politics’ and expanding democracy within the Labour party, the complete opposite is surfacing here. The base problem of inaccessibility isn’t caused by Unite, but if they’re willing to exploit it to their benefit, it draws into question everything they claim to stand for on democracy and accessibility. The ability to send files, such as photos, videos, and audio messages. Ideally, it’d also be open source, so the security protocols in use would be transparent. iMessage, WhatsApp, and Telegram seem to be the three closest to reaching this – all are good, but fall short in one way or another. Also, neither iMessage nor WhatsApp are open source, which means (and yes, this is being paranoid) there could be backdoors purposefully coded in the software and we’d have no way of knowing. iMessage is Apple’s instant messaging service, built in to iOS and OS X. Limited registration necessary – all users need is an Apple ID, which they’d be prompted to create when turning on their device for the first time, and they’d need to download apps from the App Store and media from iTunes. The Electronic Frontier Foundation (a non-profit group dedicated to protecting users’ digital rights) gave iMessage a Secure Messaging Score of 5/7. Not cross-platform, meaning it only works with iOS and OS X devices – no messaging those Android heathens! There are still some issues with de-registering a phone number from Apple’s iMessage servers, which could lead to messages being sent to you disappearing into the void if you switch from an iPhone to any other device. Closed source and proprietary, so there’s no way to check how secure the service is. FaceTime – Apple’s voice and video chat service, while separate from iMessage, has the same overall benefits and downsides as iMessage. It received the exact same score from the EFF as iMessage – 5/7 – for the same reasons. WhatsApp is a mobile IM service which runs on a variety of mobile operating systems – iOS, Android, Windows Phone, Blackberry 10 etc. With such wide mobile OS support, your friends will almost certainly be able to install and use the app on their smartphones. Cross-platform support is limited to mobile operating systems, so there’s no true Windows/OS X/Linux support5. There is an online client, but requires your phone to be on at all times. It also requires your phone be anything but an iPhone, for whatever reason (WhatsApp claim it’s due to Apple’s limitations). Finally, it requires you use Google Chrome. No multi-device support. WhatsApp doesn’t have an iPad client. Now owned by Facebook. Yes, this is a legitimate “con” for many users. The EFF gave WhatsApp a score of 2/7 – lower than iMessage. The EFF also claims WhatsApp doesn’t support end-to-end encryption. However, this is possibly due to the fact WhatsApp enabled encryption after the first version of the scorecard was published and haven’t contacted the EFF with proof of end-to-end encryption since. Either way, 2/7 is worryingly low for a messaging service whose developers claim security is one of their prime concerns. Telegram is a completely free instant messaging service with cross-platform, cross-device support. Has a web application too. Official cross-platform support for every major desktop and mobile OS, with the exception of Blackberry. The EFF gave Telegram Secret Chats a score of 6/7 – better than iMessage. Uses client-server/server-client encryption. Still secure, but not as secure as end-to-end encryption. End-to-end encryption only works in Secret Chats, which are only accessible on the device they’re created on. Very few people I know use it. Out of my contact list of 230 people, only 10 have ever used Telegram and show up as Telegram contacts. The EFF gave standard Telegram chats a score of 3/7 – standard chats in Telegram lack a number of the security features present in their Secret Chats which give them such a high score. Facebook’s built-in messaging service, accessible through the Facebook website or applications on mobiles. Changes in the Facebook API 6 mean Messenger can no longer be accessed in external applications such as Adium, Pidgin, Trillian etc. Facebook removed the functionality from the Facebook application, meaning in order to use all of Facebook’s features on your device, you need two applications instead of one. Unsurprisingly, this has not gone down well with Facebook users. Currently, both Facebook and Messenger sit at 3/5 stars on the iOS App Store. The EFF gave Facebook Chat/Messenger a score of 2/7 – worryingly low for a messaging service people use every single day. There seems to be a real gap in the market here. Nothing seems to fit the bill 100%. Nothing seems to have the above combination of features. Am I right though? Is there a gap in the market, or does anybody know of an instant messaging system which fills all the above criteria? Herbalife, Forever Living, Amway, eCosway. All of these multilevel marketing (MLM) companies promote themselves as great business opportunities – invest a small amount of money to register as a distributor and set up your own business! Earn profit from the products you sell, sometimes even without having to purchase the goods yourself. Recruit more people and get a cut of their commission too! The companies have turnovers of many billions of dollars a year. Sounds great, doesn’t it? But is there more to them than meets the eye? No, there is no way to tell if these two photos are of the same person. I strongly suspect they aren’t. With many MLM companies, the products sold tend to be nutritional supplements, weight loss products and herbal medicines. For example, Forever Living sells aloe vera gel, a 9 day “detox” weight loss pack, bee pollen products and other supplements. Straight away, we have many problems to deal with. 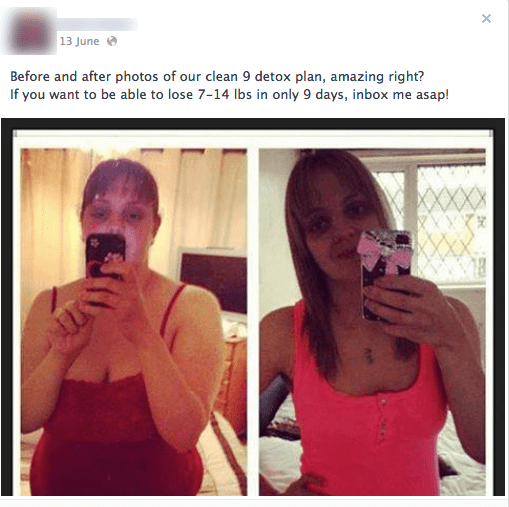 Detox is a wholly bogus idea. Sense about Science have produced an excellent dossier on detox, explaining why it’s such a fraudulent idea. Simply put, our kidneys and liver already do a great job at detoxifying the body and most detox kits don’t even state what they’re going to allegedly detoxify. Just vague “toxins”, whatever that might mean. A large number of Forever Living’s products are sold with medical claims on their website. These are small claims such as “boosts circulation” and “boosts the immune system”, but claims nonetheless. They leave the making of bigger claims, such as direct claims to be able to treat and cure named medical conditions, to their distributors, moving much of the risk to the distributors. A couple of my friends have recently, unfortunately, signed up to become Forever Living distributors as part of a team. Inevitably, my Facebook timeline became clogged with adverts for the many gels, pills and weight loss products they’re trying to sell. 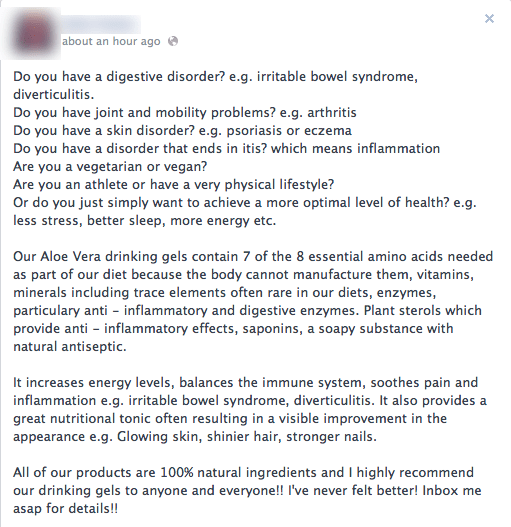 Their team leader runs a Facebook page which contains claims that the products can treat named medical conditions ranging from IBS to arthritis. They’re all ridiculous claims. Many of the weight loss advertisements don’t even appear to use the same two people in the before and after comparison shots. After researching the ingredients, as I suspected, there’s very little to no evidence to back up the claims being made. For example, there is evidence that aloe vera is an effective laxative and some studies have suggested that it may help burns, but there’s no evidence it’s effective for any other use. A few more of my friends went to an informal seminar, in a coffee shop, by this team leader in which it was strongly implied the products can treat even more serious medical conditions such as paralysis and cancer. It’s hard for me to emphasise just how wrong this is. It’s illegal to promote a treatment for cancer, under the Cancer Act 1939 s4. 1a which states “No person shall take any part in the publication of any advertisement containing an offer to treat any person for cancer, or to prescribe any remedy therefor, or to give any advice in connection with the treatment thereof…” The only exception is when the advertisement is published in a technical journal aimed at medical professionals. And yet, they and their distributors do anyway. Multilevel marketing companies often advertise becoming a distributor as great business opportunities, as if you’re becoming a self-sufficient business person. This isn’t really true. You have the main company who provides the products and then you have distributors. As I mentioned before, to become a distributor, you often “invest” a small amount of money and receive some products to sell or an online store front with your name on it. After this, you continue to sell products and are pushed to recruit more distributors. You then get a cut of their money. They recruit people; you get a cut of the new person’s money as well. You’re encouraged to recruit more and more people to set up a “down-line”. This set up is unsustainable for a number of reasons. First and most obviously, there is a finite number of people in the world. If each distributor recruits ten people, just six levels down gives you a million distributors – over three times the population of Cardiff! Having more and more sellers is beneficial for the main company as any sales distributors make, the company profits from. Theoretically, the more sellers, the more sales are made. If a distributor even sells just one or two items to their friends and family, for the main company, it all adds up. The distributors don’t benefit though, as they’re not recouping their initial cost. Besides that, there will be no more room for expansion. Ten levels down and you have 10,000,000,000 people, about 3,000,000,000 more people than there are in the world today. And that’s not considering that many of the remaining 7,000,000,000 won’t want to be part of the company or can’t be part of the company because they’re too young or already have a job etc. This ignores the even bigger problem that there’s nobody to sell to. When the main focus of MLMs for distributors is recruiting more people, there’s a problem. Eventually, the pyramid will collapse and only those on the top will profit. When there is unlimited recruiting, the supply of products inevitably and invariably outweighs the demand. Given the above, it’s perhaps unsurprising if not downright obvious that MLM companies have been compared to, or straight out called pyramid schemes. Bill Ackman, a billionaire hedge fund manager, has famously rallied against Herbalife, explicitly referring to it as “the best-managed pyramid scheme in the history of the world.” He argued, using calculations he published and presented in December 2012, that most of the money paid to distributors is payment for recruiting new distributors. For this reason, he’s called on the Federal Trade Commission in the US to investigate Herbalife. He also stated that if the FTC did investigate and found in Herbalife’s favour, he would lobby Congress to change the law, in the hopes of ensuring that Herbalife would not be able to continue to operate. The Commercial Court in Belgium agreed with Ackman’s assertions as they ruled that Herbalife is an illegal pyramid scheme, in a judgment in the case of Test-Aankoop v Herbalife International Belgium in November 2011. In the current job market, it’s not surprising that people will want to work for a company that provides them a guaranteed job. But expectations need to be managed. In the vast majority of cases, working as a distributor for an MLM company won’t provide people with anywhere near enough money to live on. According to a publication called Business Students Focus on Ethics, the average annual income for MLM members is US $5,000, while USA Today have published an article in which the Direct Selling Association has stated the median annual income is as low as US $2,400. The costBill Ackman also pointed out that less than 1% of people who join Herbalife will ever join the “Millionaires Team”, distributors who have earned over $100,000 from Herbalife in their lifetime. These figures don’t really surprise me, given the problems outlined above with market saturation, trouble recruiting more people and the impossibility of actually convincing people they need these products. When you’re constantly hard selling to friends and family, you’re going to end up annoying them. This doesn’t stop distributors from making outlandish claims about potential earnings, however. The need to set up a “down-line” ensures ridiculous adverts will continue to be published online in the hopes of recruiting equally desperate people. The problems with multilevel marketing companies are numerous, from their doomed-by-design infinite expansion set up and the fact that they mostly sell useless products. Multilevel marketing is an unsustainable, exploitative idea that unfortunately hasn’t been stamped out yet. Raising public awareness to these problems is a vital step to take to ensure fewer people are exploited and protect them from harm. These schemes need to be examined with much more skepticism in all that they do. Back in January, I was contacted by Panorama at the BBC. They told me they were doing an investigation into Dr. Stanislaw Burzynski, the doctor who offers the controversial antineoplaston treatment to cancer patients at his Houston, Texas cancer clinic. They wanted to know if I’d be interested in taking part. Of course, I accepted and was interviewed later that month about my involvement with the clinic and Dr. Burzynski. You may recall that back in November 2011, somebody called Marc Stephens, representing the Burzynski Clinic, Burzynski Research Institute and Dr. Stanislaw Burzynski himself contacted me (and others) with threats of a libel lawsuit if I didn’t remove my heavily critical, though not libellous, blog post entitled “The Burzynski Clinic”. I’d written this blog post back in August 2011 in response to one of the many big media campaigns run by families to raise the hundreds of thousands of pounds to get a place on one of Burzynski’s clinical trials. Marc Stephens went on to threaten to contact my school “to inform them of [my] illegal acts”. He also sent me Google Maps images of my own house, apparently to confirm that it was my mailing address, so they could send the legal paperwork. You can read about this all in much more detail, including the entire email back and forth on my blog post “Threats from the Burzynski Clinic”. Eventually, the Burzynski Clinic fired him, saying they found his actions inappropriate. This was the main focus of the interview. I’m not sure what will make the final cut, but I’m confident that Panorama will handle this topic with sensitivity whilst also being firm and not falling foul to false balance. Remember, Monday June 3rd at 8:30pm on BBC One (HD)! UPDATE: I received a phone call yesterday informing me that, unfortunately, my interview hasn’t made the final cut. The programme is only half an hour long and I guess if something doesn’t fit the narrative too well in the short time they had, it’ll be left on the editing floor. I have a bit of *news* about *me*! I am mere days away from turning 18! From the 22nd October, I will be able to buy alcohol, vote in elections and other things that only adults are allowed to do! I’m going to be speaking for two Skeptics in the Pub events in the coming weeks as well. First is London Skeptics in the Pub on the 30th October in The Monarch Bar in Camden. Click here for more details! I’ll also be speaking for Kingston Skeptics in the Pub alongside Suman Biswas on the 1st November! Click here for more details! Also, I am done with Cardiff High School. After a messy relationship involving far too much censorship for my liking, and some dodgy AS level results, I decided to call it quits. So instead of doing A levels, I’m studying for a BSc (Hons) in Health Sciences with the Open University! Another really cool thing I’ve been doing recently is building the http://privatehealthscreen.org website for a group of doctors. The website tackles the subject of health screening – something that isn’t as clear cut as you might believe. Go and check it out! However, there are some not so cool things happening too – the main one being that I seem to be going through a mild/moderate Crohn’s flare up. I’ve been having mild-moderate symptoms on and off for months, but assumed it would clear up the next time I had my infliximab. Despite my bloods being normal, a calprotectin test has shown otherwise and yes, I am having a Crohn’s flare up. Hmph. So anyway, that’s basically what’s been happening/what’s going to be happening with me. Fun stuff! I find Dr Stanislaw Burzynski morally reprehensible. I think this because his treatment is sold for extortionate amounts of money to vulnerable, dying cancer patients in their last months – sometimes bringing them thousands of miles away from the majority of their family – so they can be injected with a drug that’s been in development for more than 30 years, yet has no evidence base to support its use. We also know that he uses large amounts of chemotherapy in his clinic too but charging extortionate amounts of money for it. Also, I think he is morally reprehensible because if he really has discovered a cure for various cancers, why the hell is he sitting on 30+ years of research when he could publish it and convince the scientific community that antineoplaston therapy is effective? He has a moral duty to do so. Hell, even if the results are negative he has a moral duty given the amount of money he’s charging. If it turns out that his treatment is ineffective, he should put his hands up and state “Look guys, it was a hypothesis that just didn’t work out.” If it turns out that his treatment is ineffective, he’d be wise to donate the large sums of money he’s made to cancer research. Sure, it’d be humiliating to have his life’s work undone, but at the same time it means that cancer patients wouldn’t be misled into believing his treatment is effective. Another thing I don’t understand is why Burzynski’s patients/relatives of patients don’t demand that he publishes the results. They’re paying for this research to happen. Without their funds, Burzynski wouldn’t have been able to do the research. They funded it, so surely they have influence over whether he writes the trial up. Or am I just being too hopeful? If I were in that situation and something appeared to be working, I’d want it to be written up to further scientific research so that more people could benefit. or of course, phrase it in your own way. Also, if anyone knows of any way that could force Burzynski to present his data or hand it over to someone capable of writing it up. I’d appreciate your contact! Use the Contact Me link or tweet to me. Thanks. You probably haven’t heard of a man named Stanislaw Burzynski. He offers a treatment called antineoplaston therapy, which he claims can treat cancer, in a centre called the Burzynski Clinic in Houston, Texas. That’s quite a claim, but the Nobel Prize Committee does not need to convene quite yet, because this treatment has been in non-randomised clinical trials since its discovery by Burzynski some 34 years ago. Moreover, no randomised controlled trials showing the effectiveness of antineoplaston therapy have been published in peer reviewed scientific literature. I first heard of Burzynski when a friend of mine tweeted about something called “Hope for Laura”, a campaign to raise the money to send this young mother from Kent to the Burzynski Clinic in the hope that they could cure her of her inoperable, terminal brain cancer. The campaign became big news after the well-meaning Rufus Hound tweeted about it. Because of the campaign, I did a little bit more research into the treatment regime that Laura was hoping embark on and I learned about the lack of scientific evidence for the treatment. There have been quite a few more campaigns similar to “Hope for Laura” to raise money to send more people to the Burzynski Clinic for the antineoplaston treatment. In one such campaign, Radiohead donated a guitar to raise money for one girl’s treatment. blogs about the same subject – in particular, Keir Liddle of The 21st Floor and Jennifer Keane, a.k.a ZenBuffy. These particular blogs are excellent and go into a lot more detail about the false hope dilemma. Orac, of Respectful Insolence, has gone into a lot of detail about Burzynski’s background and the antineoplaston therapy – it’s a blog that I strongly recommend you read. Then, out of the blue, on the 3rd of November, I received an email from a man called Marc Stephens, claiming to represent the Burzynski Clinic. He was threatening to sue me for libel for my previous blog about the Burzynski Clinic. I represent Dr. Stanislaw Burzynski, Burzynski Clinic, and Burzynski Research Institute. It has been brought to our attention that you have content on your website http://thewelshboyo.co.uk/2011/08/the-burzynski-clinic/ and on your Twitter account that is in violation of several state and federal laws. This is a legal complaint regarding the your multiple twitter account posts, and article you posted online titled “The Burzynski Clinic dated August 28, 2011, by Rhys Morgan”. This correspondence constitutes a demand that you immediately cease and desist in your actions defaming and libeling my clients. Please allow this correspondence to serve as notice to you that you published libelous and defamatory information. Please be advised that my clients consider the content of your postings to be legally actionable under numerous legal causes of action, including but not limited to: libel, defamation, and tortious interference with business contracts and business relationships. The information you assert in your postings is factually incorrect and posted with either actual knowledge, or reckless disregard for its falsity, and with the actual and specific malice to injure my client’s business relationships in the community. I am not sure if you are familiar with Defamation (Libel). If not, I will assist you. Libel is a published or fixed form of defamation of character; a civil wrong that falsely impugns the reputation or character of a person or entity, opening the target up to public scorn or ridicule. Libel might appear in a magazine, book, newspaper, or in a radio or television broadcast. Signs, billboards or posters can also be mediums for libel. Online libel, or cyber libel takes electronic forms such as email, mailing lists, newsgroups, chat rooms, podcasts, vodcasts and Web pages. Although many citizens do not yet realize it, comments made to chat boards, newsgroups and even mailing lists are all forms of publication. Criticisms of companies or their goods can be a basis for libel charges if the poster misrepresents facts, or fails to qualify his or her post as opinion. I am not sure where you obtained your incorrect information, but you will be held liable for your statements. REMOVE ARTICLE IMMEDIATELY. As you may guess, this caused me to panic somewhat. The threat of being sued for libel is not an exciting prospect by any stretch of the imagination, even if you know that your piece is not libellous. I am confirming I have read this email. I notice you have stated that some tweets are defamatory. I would appreciate you linking to them please so I can deal with them appropriately. Unfortunately, when he found out that I was in school, his attitude changed. Once you remove your libelous statements, you will agree, that you immediately cease and desist from making any further unsupported, defamatory, libelous or harmful statements relating to my clients through any medium, including the Internet. You are to remove existing statements, and are not to post, host, or make available any libelous, false or defamatory statements against my clients via the Internet, television, radio, print or any other forms of media. You shall not create any new alias, nor use any old alias, to post, host, or make available any statement regarding my client via the Internet, television, radio, print or any other forms of media. You will provide a public apology to Dr. Burzynski and his patients and post it on your websites, and social media sites. Once removed, I can provide you with the correct information from the National Cancer Institute and several doctors who testified to the effectiveness of Antineoplastons. In addition, my client is FDA approved for Phase 3 clinical trials. You are reading lies and misunderstandings on the internet, which you are still liable for re-posting this information. I appreciate you contacting me to resolve this matter. I decided at this point to take the post down, not to admit liability or guilt, but so that Mr Stephens and I could hopefully discuss the supposed problems before deciding on an appropriate course of action. In my response, expecting him to know the obligation to follow pre-action protocol, I asked him to tell me the exact words his client,The Burzynski Clinic thought were libellous and why they were libellous. I am writing this email to inform you that I have taken the post in question down. However, I state that this is not a confession of liability or acceptance of guilt. This has been taken down until we can agree on an acceptable course of action. In response, I would like you to tell me exactly which words you think are defamatory and explain why and how they are defamatory. Similarly, I would like you to tell me exactly which tweets are defamatory and why they are defamatory. I would like this by 6pm GMT on Monday, 7th November. I greatly appreciate you removing the articles and comments. You are responsible for whatever you post online. You need to spend time understanding defamation laws if you want to start a career as a blogger. You can be sued for “Not Knowing”, its called Negligence. You can not interfere with business relationships and contracts. If you do not understand what you are doing I suggest you stop posting articles. Your “Opinion” can also get you sued. Look up the recent Google case in the UK. Google was sued and lost because their algorithm created “SCAM”, “FRAUD”, etc next to a business owner’s name. We also filed a complaint with Google and they had to remove the wording. If you think you are bigger than Google than enjoy life in the court room. There are many stories online that you can find that tell you the truth about Dr. Burzynski. If you are interested in learning I can guide you to the truth. I’ve watch some of your videos and you are a really smart guy. Use that intelligence in a positive way. Be careful online and good luck. He seemed to have completely ignored my request to tell me the wording. He also seemed to think he’d managed to silence me, that I’d removed the post forever. However, this was only the 4th of November, one day into the time I’d given him to respond. And so I waited to see if I would receive anything explaining exactly which words he considered libellous and why they were libellous, in the opinion of The Burzynski Clinic. Out of courtesy, I even extended this deadline to the 14th of November. This deadline passed without any response. Seeing as he’d not bothered to reply to me, I considered reposting the blog as well as an earlier version of this one. First though, I sent an email to the Burzynski Clinic’s corporate email address with a copy of the email thread between Marc Stephens and me, a copy of the original blog and an earlier version of this post. I wanted to know if they considered anything factually incorrect or not. I attach an email (titled Email Thread.pdf) I have received from one Marc Stephens, who claims to represent you. As you can see from the attachment, he states that he represents you, and furthermore threatens me with libel proceedings in respect of material I posted on my blog. I have carried out some internet research, and I have not been able to establish whether or not Mr. Stephens is a lawyer; certainly he does not appear to be a member of the California Bar nor the Texas Bar in the light of my visit to the California Bar Association’s and the State Bar of Texas’s websites. Please could you confirm for me whether he does in fact represent you and, if he does, on what basis he does represent you. In the light of Mr. Stephen’s email I attach a copy of an article (titled Burzynski Blog Final.pdf) I propose to post on my blog as well as the original blog post (titled The Burzynski Clinic.pdf) which is currently offline. Please could you tell me within 7 days what, if any, of the blogs you object to, and, in particular, whether you believe any of the blogs to be factually untrue. Of course, I wasn’t going to leave it there. He continues to bring unqualified threats against me. My response? You continue to threaten to bring a claim against me for defamation. In the event that such a claim is brought in the USA I will rely upon the well-known authority of New York Times Co. v. Sullivan 376 U.S. 254. As you may be aware, this would require your client to show proof of actual malice before they could succeed in any libel claim. My postings are clearly not malicious. I believe in their truth, and I have sought to obtain a comment from your client, or else at least ascertain any objections to specific items within the posting. I am willing to listen. I would certainly reflect your client’s position if asked. If the claim is brought in the English courts, you ought to be aware that in the light of the well-known decisions of Rookes v Barnard  AC 1129 and Broome v Cassell  AC 1028 you will not be able to bring a claim for punitive damages on these facts. You also ought to follow the procedures set out in the Pre-Action Protocol for Defamation which require you to, amongst other things, set out precisely what your client objects to and why. This is an issue which you have failed to address. I am not asking for a legal lecture from you. What I am asking for is clear information of what your client objects to, and why. As things stand, I have heard nothing substantive; I have just received threats. I also note that you threaten to mention my “illegal acts” to my school. Notwithstanding the fact that I have committed no “illegal acts”, the threat to involve my school is wholly inappropriate. If an English solicitor was to make such a threat they would be in breach of their professional obligations and subject to disciplinary proceedings by the SRA. Please inform me which US bar association you are a member of so that I can draw their attention to your threats. Then, on Wednesday, 23rd September (Edited: Typo!) – November one day before the new deadline was up – I received an email from a law firm called Dozier Internet Law. They informed me they had been hired by the Burzynski Clinic to “investigate and address the issues regarding [my] blog” and respond to my questions in the email sent directly to the Burzynski Clinic. They’ve not replied within the deadline I gave. As such, I have reposted the original blog and posted this new blog detailing exactly what has happened to me. It’s taken nearly a whole month to sort through this legal mess. I’m incredibly lucky that it hasn’t been even longer. I’ve also been very lucky to have help and advice from Alan Henness, Simon Singh and Robert Dougans, associate at Bryan Cave. The legal advice and help I’ve received has been invaluable and has brought me to where I am now – reposting the blog and telling the story of my legal threat. I posted the blog so that patients, their friends and families would be aware of the whole story about Burzynski and his unproven therapy. I want them to be aware that the treatment seems to be in a constant cycle of trials generating unpublished results. As Dr Howard Ozer, director of the Allegheny Cancer Center in Philadelphia, said – it is scientific nonsense. Add a link to this blog from your website so that it will increase the PageRank for this blog so that when patients search for Burzynski, they discover this blog as well as Dr Burzynski’s propaganda. This way, they can discover the whole truth and determine for themselves whether it’s worth investing in his treatment. The Burzynski Clinic is a clinic dedicated to treating cancer patients. It is based in Houston, Texas. It pioneers a treatment called antineoplaston therapy. Except, this treatment isn’t pioneering. It isn’t effective. It does not work. And yet, the Burzynski Clinic continue to profit off it. I am sickened and appalled that cancer patients are being exploited. The theory behind antineoplaston therapy is that certain peptides were apparently less prevalent in the blood of cancer patients than in healthy control subjects. This was first identified by Stanislaw Burzynski. He then hypothesised that replacing these missing peptides, which he renamed antineoplastons, would be a cure for cancer. The Burzynski Clinic, which opened in 1977, has been in the news a couple of times recently, first in the case of Laura, a 24-year-old mum, of the Hope For Laura campaign, then more recently in another campaign to get Sean Lyne, a 19-year-old featured in an article in thejournal.ie, to the treatment centre in Houston for the €120,000 antineoplaston therapy. The Burzynski Clinic promote themselves as offering an “[i]nnovative and cutting-edge Personalized Gene Targeted Cancer Therapy [with] [c]ustomized treatment for over 50 types of malignancies”. However, their antineoplaston treatment has been in clinical trials since it’s inception. Straight away, this shows an intellectual dishonesty on Burzynski’s part – promoting an experimental treatment as if it were effective. Burzynski’s published research has been criticised by oncologists and scientists alike. Dr Howard Ozer, director of the Allegheny Cancer Center in Philadelphia, called the research “scientific nonsense”. Independent studies failed to replicate Burzynski’s results, suggesting there may be a strong bias in Burzynski’s research. The FDA have not approved the treatment for any diseases. A 2004 analysis of evidence for a number of alternative treatments for cancer, including Burzynski’s own antineoplaston therapy, said that “The label “unproven” is inappropriate for such therapies; it is time to assert that many alternative cancer therapies have been “disproven.”” In short, it’s quackery – ineffective treatment promoted as effective and sold for a very high price. I hate the idea of taking away someone’s last hope. Even though this is false hope, I still hate taking it away. But imagine if this was your family member, being misled and dragged halfway across the world, being taken away from the majority of their family to spend the last bit of their life being injected with an ineffective treatment every four hours. I would be fuming if this was anyone close to me. The false hope dilemma has been covered before by both Keir Liddle of The 21st Floor and Jennifer Keane, a.k.a ZenBuffy. When the Burzynski Clinic is in the news, it’s always described as providing a treatment that is unavailable on the NHS. The main reason for this is that it’s in clinical trials. The 17 trials started by Burzynski began in the 1990s and have an estimated end date of 31st December 2011. The other, probably more important reason is that in small studies, it hasn’t proven to be effective. Burzynski’s own research and findings haven’t been replicated. The district court granted summary judgment for the plaintiff/appellee, the Northwest Laundry and Dry Cleaners Health & Welfare Trust Fund, an ERISA health insurance fund, after finding that the defendant/appellant, Dr. Stanislaw R. Burzynski, had defrauded the plaintiff and violated the terms of the health plan. We agree that the defendant may not trick the plaintiff into paying for an unlawful, unapproved drug. It is for all these reasons above that I take no issue with calling Stanislaw Burzynski a quack and a fraud. I live with a chronic condition. It is called Crohn’s disease, a disease which affects the bowel and can affect other parts of the digestive system. It is an autoimmune disease, but we don’t know what causes it yet. It is lifelong and incurable. It is only treatable. Its symptoms include diarrhoea, fatigue and abdominal pains. I’m one of the lucky ones in that I am on a treatment that is working and has put the Crohn’s in remission, called infliximab. Infliximab is a drug that binds to a chemical messenger called tumour necrosis factor alpha (TNFα). There are only a few of other drugs that do this. Luckily, I am now starting to live a relatively normal life. I am a teenage boy doing normal teenage things – going out with friends, playing video games and eating a lot of food (something I couldn’t do when the Crohn’s wasn’t in remission!) But, in the past couple of years, I have had to do a lot of growing up, simply to try and cope with such a diagnosis. Future treatments and potential cures are in development. I hope that within my lifetime that a cure will be found, however unlikely this is. I hope that many more treatments are developed to put people in remission for a long time, to prevent them suffering. However, there will come a day when infliximab stops working. I wake up every morning hoping that today will not be that day. There will come a day where the next treatment stops working and any other treatments stop working and, my god, I do not want those days to come soon. I am young and yet I face a life of dangerous drugs, clinical trials and surgery to remove parts of my bowel ahead of me. And I wish I didn’t have to suffer with it. This is a blog post about my mental health issues. I am depressed and I have general anxiety problems. I was diagnosed with depression earlier this year. I’d been suffering with symptoms for a while – feeling sad most of the time, self-loathing, insomnia. These had been affecting me for years on and off. Only recently did I have a seriously distressing depressive episode. I decided to go to the GP to tell them about it and see if they could offer any help. I sat down with him and told him that I thought I was depressed. I explained how I’d been feeling and how it had been affecting me. Straight away, he agreed that I was depressed. He asked me to fill in a questionnaire about how I’d been feeling. I came out as being moderately to severely depressed. The GP told me that as I was under 18, he wasn’t supposed to prescribe me anti-depressants. Instead, I was to be referred to the psychiatrist as part of the CAMHS (Child and Adolescent Mental Health Services). I waited for a while. A referral letter didn’t come through. I was getting quite distressed by this. Eventually, I went to see my gastroenterologist about my Crohn’s disease. I told him about the depression. He referred me to see a clinical psychologist who worked with the gastroenterology department in the UHW. I waited for a referral. Not too long after, the referral letter came through the door and I went to see the clinical psychologist. We talked over how I’d been feeling. We started looking over problems in the past that may have contributed. We discussed possible treatment options in a second appointment the next week. After waiting close to one and a half months from the original GP appointment, I decided to book another appointment. I saw one of the main GPs in the surgery. I sat down and told him about how I’d been feeling. He also pulled up the results from the questionnaire that I did with the other GP. He could see that I’d been waiting for a while for the CAMHS appointment. He also told me that it wasn’t protocol to prescribe anti-depressants to under 18s, but that he would speak to his colleagues to see what could be done. About a week later, I got a call back telling me that they were willing to prescribe me citalopram, an antidepressant, and some zopiclone to help with the insomnia in the short term. I went back to the GP and picked up the prescription. Day to day, I hadn’t really been feeling great. I was still tired from the insomnia keeping me up and still having to get up early for school. This, in turn, didn’t help with my mood. I started on the citalopram at a dose of 20mg a day. For the first few weeks, I didn’t feel much different. However, after about a month of starting them, my mood started getting better. My sleeping pattern was also normalising. The appointments with my clinical psychologist were going well. Things were starting to look up for me. Unfortunately, I started having problems with really bad days. I had one seemingly random period of about three days where I’d been getting quite distressed by my depression. This carried on. I saw the GP again and upped my dose to 30mg a day. I started feeling great soon after this. Day to day I was feeling much better. This continued for a while. However, again, my good state started collapsing down around me. I was suffering with anxiety. It started to become somewhat disabling. I was stopping being able to talk to people, feeling really anxious about going out. It was distressing and didn’t help with the depression at all. In fact, it was almost as if I was back to step one. I finally had an appointment to see the psychiatrist. I told him about the depression, my history, schooling etc. He also very quickly picked up on my anxiety. As I sat there talking to him, he noticed the nail picking – my main anxious tic. He told me that he wanted to review me every three months and I was on my way. I went back to the GP last week after a trip abroad to Cyprus. The trip is when my anxiety really started getting to me. If it was bad before, it was getting out of hand now. I just sat around on my iPad for the entirety of the holiday. I didn’t want to go round checking to see if there were people my age to make friends with or anything. I sat there with my iPad – my barrier. My GP upped my citalopram dose again to 40mg a day and put me on propranolol, a beta blocker drug that . I tried it out at home to see if the background anxiety would begin to fade. It did. The random humming that only I noticed and the subconscious desire to pick my nail. They went much more quickly than they’d started. However, disaster struck a couple of days ago. I had a suspected allergic reaction to it. Before I’d even had a chance to use it in a situation where I would benefit from it’s use! I called the GP the next day to be put on the emergency list, given that the patient information leaflet told me to see a doctor as soon as possible. Yes, my dad is a doctor, but it’s not quite the same! I saw one of the main GPs in the surgery who told me that it was probably best I stopped the propranolol. We talked briefly about the anxiety and how it’d been affecting me. She decided to prescribe me some diazepam, a benzodiazepine, 2mg a day to start off with. This is my story so far. At the moment, I’m feeling good. I am tolerating the diazepam well, but it’s early days. I have an appointment to see my regular GP on the 19th of August, so not too long. Hopefully, I’ll be put up to the normal dose of diazepam. I hope that this is the treatment for me, even though it is a short term solution. I hope it will bring me out of this anxious state long enough to be able to deal with the underlying problems. That’s what I think the citalopram did. It brought me out of the depressive state to see the underlying anxiety more. Talking about mental illness is not an easy thing to do. It’s still seen as a ‘taboo’ subject – something you wouldn’t mention in the same way you’d mention a broken arm, cancer or other physical illnesses. I hope by talking about my experiences, it will encourage others to know that help is out there. People are willing to listen and help. The only way to break the taboo of mental illness is by talking about it more.